A friend recommended Lumberjanes to me and it was cheap to pick up the first issue digitally so I gave it a shot. I like the premise enough. 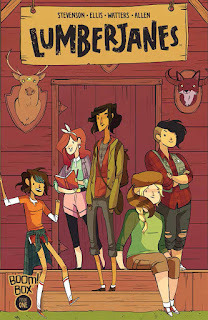 A bunch of girls are at a summer camp and they seem to be involved in some paranormal goings on that no one else is aware of. It's a cool premise. The problem I had is that not enough actually happened in the first issue to get me invested. They took the entire issue just to state the premise and then it ended. There was no hook that made me go pick up the next one. I'm always looking for more comic recommendations but this one just wasn't for me. Maybe someday I'll give it another shot and dig in a few issues deep.